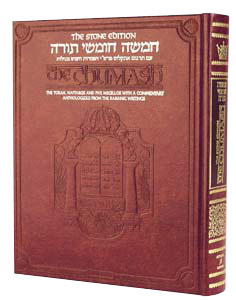 A Classic in its own time… The entire Chumash, newly reset, in one beautiful volume with a new, contemporary English translation of the Torah, faithful to Rashi and the classic Rabbinic commentators, and an anthologized commentary by a team of scholars, under the editorship of Rabbi Nosson Scherman. This commentary draws on the spectrum of biblical commentaries, from the Talmud, Midrash, and the classic Rabbinic commentators, and includes insights of contemporary greats. Also includes: Hebrew/Aramaic texts of Rashi and Onkelos, newly set according to the most accurate texts. Haftaros with new translation, and introductory comments introducing the haftarah and relating it to the Torah reading. The Five Megillos with translation and commentary. Lightweight, opaque, acid-free paper for decades of quality use. Special section for your own genealogy and family milestones. Ultra-reinforced binding, using the most durable materials.